Average Weight	: 30 - 85 lbs. Developed from the Bull and Terrier types of yesteryear, the American Pit Bull Terrier was bred as an all-around farm dog, working the farms as a cattle/hog dog. Some chose to turn their talents into the sport of pit-fighting. The breed's tenacity and accompanying strength are unmatched in the canine world. As rich and captivating as the breed's history is, the Pit Bull's future is more worthy of commentary. Some proponents of the breed argue that this breed is the original bulldog of the past. Old prints and woodcarvings show reason to believe this. They show dogs that look exactly like the breed today, doing things the dog is still capable of doing. For more information on this theory you can read books by Richard F. Stratton. The APBT, as registered by the UKC, is an individual breed of dog and does not refer to just any ill-bred, mindless warrior-type mongrel. At one time, the Pit Bull had an all around reputation of a much loved, trustworthy companion. Unfortunately the breed has become a status symbol for many types of criminals who chose to train these dogs to fight. It is those types of people who are chiefly responsible for the banning and witch-hunting that has been sweeping the U.S. The media, however, should not go unmentioned, for it is also responsible for escalating isolated incidences in a relentless and attention-getting way. Most Pit Bulls are bred as family dogs or sports such as weight pulling, but the media will rarely mention this. They get more views pretending all Pit Bulls are bred by fighters. In a lot of cases when the media is reporting about a Pit Bull attacking, it is indeed not even a Pit Bull at all, but a mixed breed of some sort, or another bull breed all together. For example, there was a report on KYW news in Philadelphia about two Pit Bulls attacking a person. The dogs did not look like Pit Bulls, but rather Boxer mixes. The news station was called and asked if they knew the dogs were in fact purebred American Pit Bull Terriers, or another bull breed of some sort, or mutts, for that matter. They stated they did not know, and to call the police station to verify that information. They were asked how they could report something that they were not sure of. As a Terrier Breed this Breed was bred to kill rodents ~ smaller animals than themselves. They still have this "DNA" chip; and while owners rarely see it, and therefore believe their dog won't hurt small pets or toddlers, this trait can surface in an instant any time during its lifetime. It may not show for years ~ and then "bam" ~ their instinct to kill emerges. Be aware! Very emotional, rational and can have irrational responses. Do well in apartment lifestyles. Generally healthy breed, although some are prone to hip dysplasia, cataracts, allergies to grass and congenital heart disease. Natural aggression towards other dogs and animals. OK with other pets when raised with them. Should not be left alone with unfamiliar children. Obedient. Courageous, great Guard Dog. Knows when everything is OK, or needs guarding. 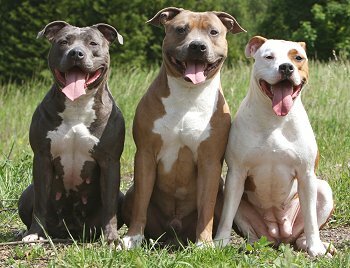 The American Pit Bull Terrier (APBT) has a strong pleasure to please. The APBT has evoked more human emotional, rational and irrational response than any other breed that exists today. By no means are these dogs people-haters or people-eaters. Pit Bull's natural aggressive tendencies are toward other dogs and animals, not people. However if you properly socialized them with a firm, but calm, confident, consistent pack leader, they will not even be aggressive with them. The American Pit Bull Terrier is a good-natured, amusing, extremely loyal and affectionate family pet that is good with children and adults. Almost always obedient, it is always eager to please its master. It is an extremely courageous and intelligent guard dog that is very full of vitality. Highly protective of his owners and the owner's property, it will fight an enemy to the death. It is usually very friendly, but has an uncanny ability to know when it needs to protect and when everything is okay. This is a Terrier that can be willful with meek owners and needs a firm hand. They are generally okay with other pets if they are raised with them from puppyhood. They are very friendly, but not recommended for most people, because most people do not understand how to properly raise and treat a dog. Problems arise when one does not understand natural dog behavior, seeing the dog as having human emotions, and ends up with a dog who thinks he is the boss of the house. For a smaller, not as powerful dog, people can sometimes get away with this, however, for a powerful breed, one really needs to understand and follow this concept of keeping a dog. If you would like some guidance & learn how to best and properly treat your dog tune into TV's Dog Whisperer ~ Cesar Millan (recommended to all dog owners regardless of the breed they own). Excellent with children in the family, they have a high pain tolerance and will happily put up with rough child play. As with any breed, they should not be left alone with unfamiliar children. Used as all-around working farm dogs, they were referred to as "the poor man’s horse." Later they were used as fighting dogs; the powerful American Pit Bull may go for the throat of strange dogs. A minimum of training, along with the proper amount of exercise and a firm pack leader, will produce a tranquil, obedient dog. Socialize very thoroughly when young to combat aggressive tendencies and be sure to keep the dog under control when other dogs are present. Teach this dog respect for humans by not allowing it to jump up and not allowing it to enter doorways first. You, as a Pit Bull Terrier owner, must make the dog heel beside or behind them when walking. It has given outstanding results as a guardian of property, but is at the same time esteemed as a companion dog. The objective in training this dog is to achieve pack leader status. It is a natural instinct for a dog to have an order in its pack. When we humans live with dogs, we become their pack. The entire pack cooperates under a single leader; lines are clearly defined and rules are set. You and all other humans MUST be higher up in the order than the dog. That is the only way your relationship can be a success. When properly trained and socialized, this is a very good dog and a great family companion. Unfortunately, some choose to promote the fighting instinct in the breed, giving it a bad name.